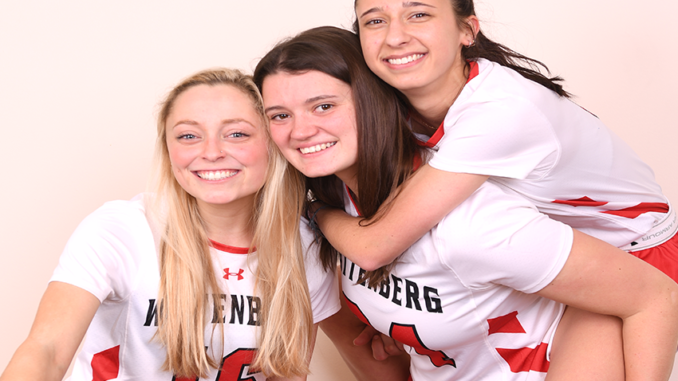 On Saturday, April 13, the women’s lacrosse team honored their three seniors before taking on the Ladies from Kenyon College, losing 21-17. Gretchen Burkey, ’19, is a defenseman who hails from Wooster, Ohio. In the past three seasons, Burkey has played in 50 games, plus the 13 she has played in so far this season. Currently, she has 30 career goals under her belt, with more opportunities to score as the season winds down. She also has five assists. Madeline Stock, ’19, is a mid-fielder from Maineville, Ohio. She is a nursing major on campus and has received varsity letters all three of her previous seasons. With 58 games under her belt and more to come, Stock has scored 65 points with 22 assists. Emily Wadds, ’19, is an attacker from Cincinnati, Ohio, majoring in marketing and communications. In her time as a Tiger, Wadds has appeared in 63 games and scored 214 points. She has taken 288 shots on goal and has 44 assists, with opportunities for more as the season winds down. The Tigers had a tough go of it in the first half and were unable to score until the Ladies had a seven-point lead. Gabby Zysik, ‘20, managed to take the ball up the field and to the net, scoring an unassisted goal and putting the Tigers on the board 12 minutes into the half. Less than a minute later, Josee Clayton, ’21, was able to knock one past the Kenyon keeper with an assist from Zysik. The Tigers were officially on the board and in the process of making a comeback. The Ladies scored twice more, taking a 9-2 lead before Wadds was granted a free-position shot that slowly worked to close the gap. Clayton scored three more times in the first half with an assist from Zysik on the first. Rachel Bernard, ’20, then scored, leaving the Tigers down 15-7 at the end of the half. With fewer goals scored in the second half, the Ladies of Kenyon still managed to lead by 11, allowing for the running clock. Katurah Emery, ’22, scored an unassisted goal during the running clock, but Kenyon was still ahead. Fighting tooth and nail through the Kenyon defense, Burkey was able to sneak one passed the Ladies’ goalie and put a stop to the running clock. Kenyon was able to score again, regaining the running clock, but not for long. Zysik scored off of a free-position shot that ended the running clock and sparked some energy from the Tigers. The red and white put up six goals in eight minutes: two from Wadds and Burkey, one from Clayton and the free position-attempt from Zysik. Clayton and Zysik both scored again before the clock ran out and the Ladies of Kenyon captured the 21-17 victory. While the Tigers may have lost, they made an enormous comeback and were seen walking off the field smiling. Coming up, the Tigers are set to hit the road and take on Denison University on April 16 at 4:30 p.m. The team will then return home on April 20 to take on the Allegheny College Gators at 12:00 p.m.